Fjuul is the easiest way to an active day. 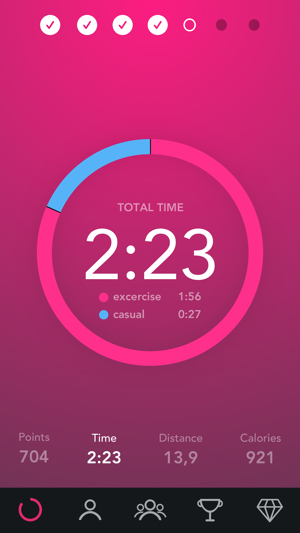 It automatically tracks your daily movements, highlights your healthy habits, and guides you towards your fitness goals. 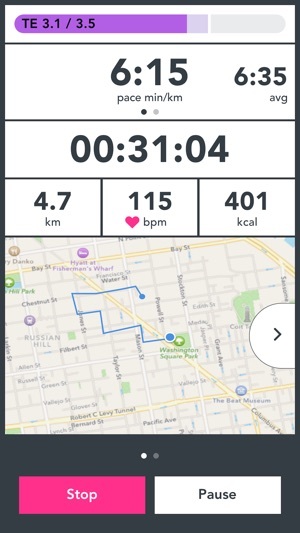 You can now see how your physical activities impact your health and fitness and understand the links between your lifestyle choices and your wellbeing. Fjuul Premium turns your device into a full-fledged sports device with real time workout guidance and dynamic coaching that adapts to your personal fitness level (VO2max). Get understandable and actionable insights regarding your training and recovery. Learn how to improve your performance and reach your optimal fitness level. Support Apple Watch and Bluetooth Smart devices. Fitness level (VO2max) enables you to see training efficiency in consistent terms to track whether your training gives you proper results or not. 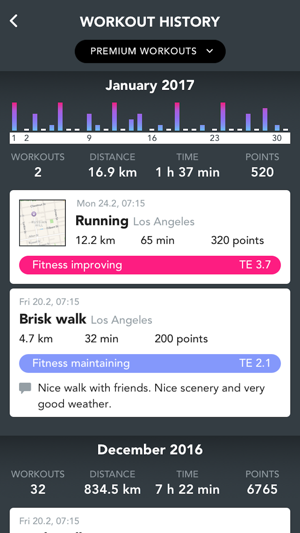 Fjuul makes it easy to see changes in your fitness level. These changes are used to adapt the training program and optimize training loads for faster progress. Training effect tells you the impact of aerobic exercise on your body, whether it keeps you fit or improves your fitness. No more guesswork – discover how effective your exercise really is and avoid too high load. Coaching advice is a highly personal training tool. It prescribes you the workouts that are suitable for your fitness level and personal goals, and knows when you should rest or take it easy. 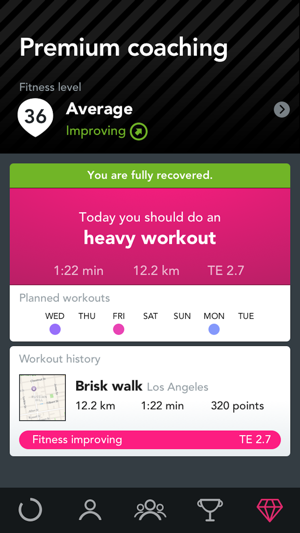 Real-time guidance will help you to get the most out of your current workout. You will be guided to keep up the right intensity in order to get the results you want. Recovery advisor keeps track of your physiological state so you know when to take it easy and when you are ready for the next intensive run. After the workout, it shows the time your body needs to recover before the next effort, so you can optimize the balance between rest and training. Race time prediction is the estimated time to complete your running goals. Whether it’s a 5K or a marathon you can see how long it would take to triumph them. Improve your fitness for faster times, set your own race time goals and start training! Subscriptions for Fjuul Premium are $4.99 per month or $39.99 for a full year. Fjuul Premium subscriptions will be charged to your iTunes account after your confirmation of purchase. Your monthly subscription will automatically renew each month and be charged through your iTunes account, yearly subscriptions will automatically renew each year. Subscriptions renew at $4.99 per month or $39.99 for a full year automatically unless cancelled at least 24 hours prior to the end of the current period. You can turn off auto-renew at any time from your iTunes account settings. Cancellation of the current active subscription period is not allowed. © 2017 Fjuul Vision Oy, All rights reserved. What a trash app this is, total wastage of time and money. 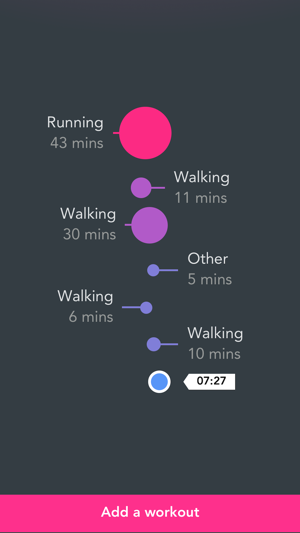 It counts steps even when I am just sitting and holding my phone in my hands. And it crashes during the night too. I want my money back and I will spare you. And you are lucky that apple doesn't allow to put negative rating so here you go 1 star for you.